Bordeaux is primarily about place, secondarily about time. 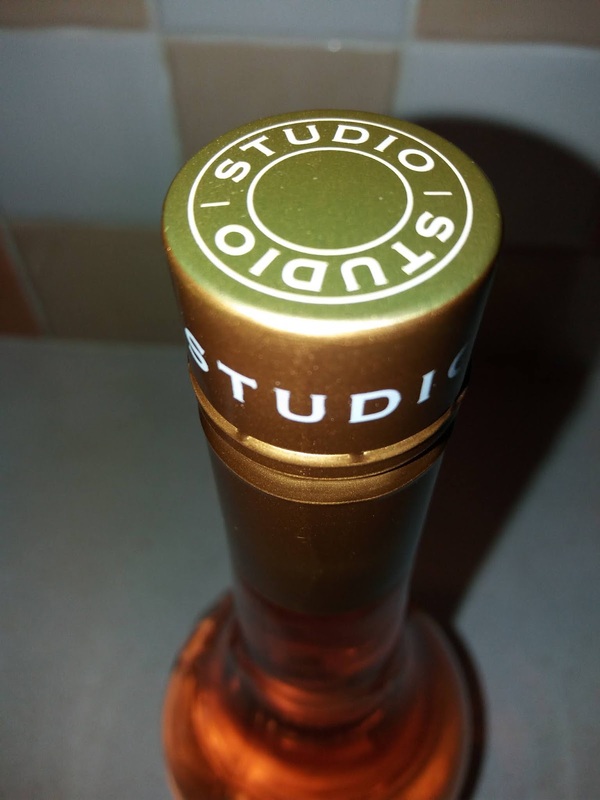 Other considerations, such as grape variety or winemaker, are deemed trivialities and demoted to the back label; you buy a Pauillac 2015 or a Saint-Émilion 2010. Here, the grape is merely an expression of the soil and ripening conditions of the year, the winemaker's role more technical director than visionary. They say in a good year you buy the second wine and in a bad year the first wine; that is exactly what we have here - in a sense; a lesser appellation from a better year vs a better appellation from a weaker vintage. As to which is better, the market and / or accolades can often tell you what you need to know; the Medoc is a Cru Bourgeois priced at almost double that of the Blaye. If, like Richard Bampfield MW, you drink pretty much exclusively reds, the juicy, Merlot-dominated Blaye could be your aperitif / starter wine, with the textured, Cab-dominated Medoc accompanying main and cheese. Château Les Martins 2014, Côtes de Bordeaux, Blaye (£9.49, Waitrose) fresh with bramble and cherry fruit, liquorice, spice, pencil shavings and fine, gentle tannins. Adept and will age further. We matched this with toasted ciabatta, rubbed with garlic and tomato topped with basil, tomatoes and olive oil. 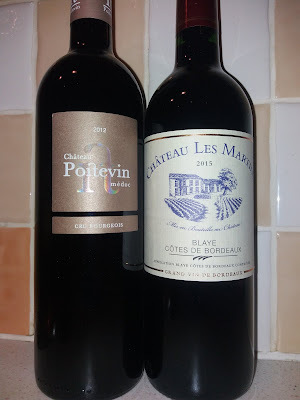 Château Poitevin 2012, Médoc Cru Bourgeois (£17.95, Lea and Sandeman) minty-herbaceous with dark bramble fruit, leather and complex oaky spice; fresh and inky with a dense muscular core. Supple with firm, fine tannins. Still very youthful and primary; will repay cellaring. We matched this with aged, Aberdeen Angus rib steak (rare, of course). 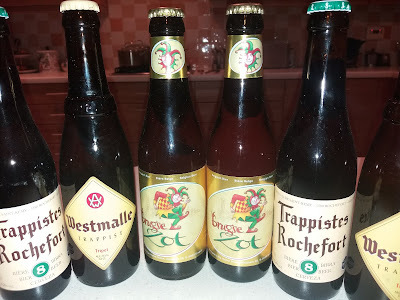 The Belgians seem to combine a Gallic love of gastronomy and religion with a Germanic affinity for beer and Byzantine complexity. Too northerly a climate for wine, Belgium produces a vast array of beers, often made in abbeys by Trappist monks, of different styles, colours, alcohol levels and sweetness each with its own, impenetrable code of dubbel, trippel and quadrupel (see guide here) and often their own bespoke glasses. Belgians also seem to share a Teutonic love of eating and drinking out as a competitive sport; it is hard to pin this down precisely but for Italians eating and drinking well is part of a general lifestyle statement; for the French, it is an innate raison d'etre while for Germans, and quasi-Germans, it is a status symbol and public announcement of general success in life. 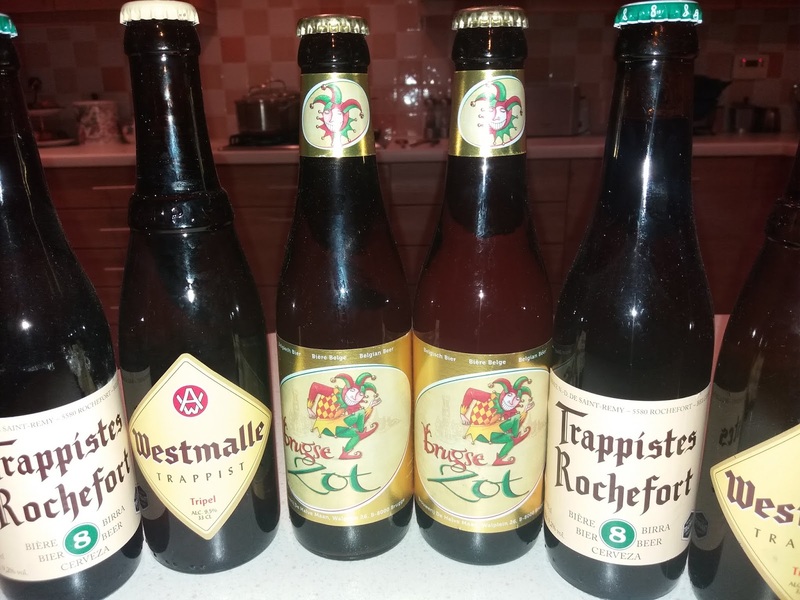 Returning from a family holiday in Bruges last year, we decided to being back some of the local stuff. Brugse Zot from local brewery De Halve Maan, rich, malty and complex golden ale. Westmalle Tripel bigger, stronger, sweeter and more bitter. Citrussy and floral, too. More of everything. Trappistes Rochefort 8 sweetish dark ale, complex with fruitcake, bitter, roasted nuts and spices Good. I've said it before, I'm a bit "meh" about Pinot. I actually want to like it but sitting next to an MW at a Burgundy tasting, I struggled to find it anything other than ... well, thoroughly pleasant. So decent, inexpensive Pinot is probably best for me. Anything better is wasted on my non-Pinotphile pallet. Does good inexpensive Pinot exist, you may ask. 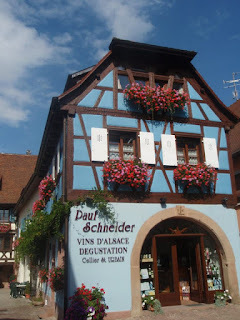 Indeed it does; if you happen to be in Alsace on holiday and able to pick up a bottle of the local stuff from the cellar door. 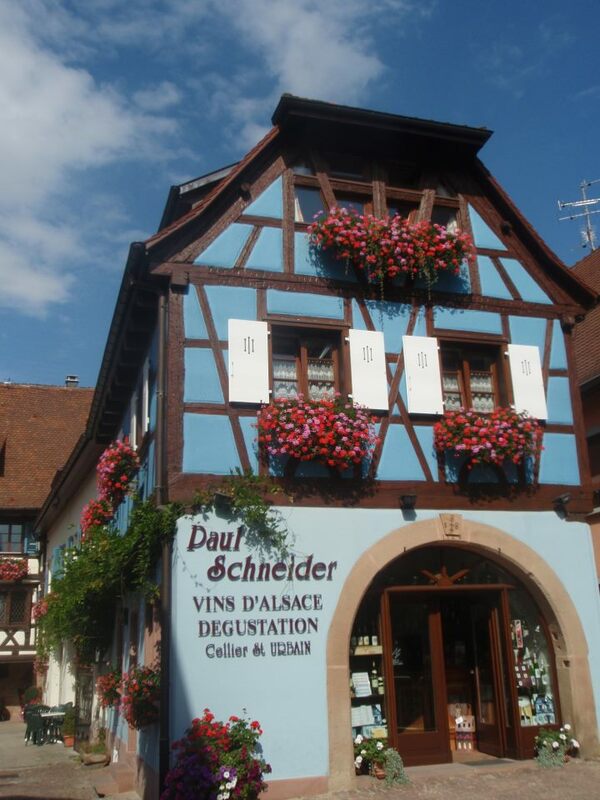 Domaine Paul Schneider is based in the ridiculously pretty (even by Alsace standards) village of Eguisheim at the southern end of the Vosges where the hills are higher and the climate correspondingly drier and milder. This Gold Medal Pinot is indistinguishable from a light Burgundy that would have cost quite a bit more - to my palate at least. Drink as an aperitif if you have some Big Reds to follow or match with picnic foods, salmon or other game. Ad Man David Ogilvy once observed, people don't know how they feel, don't say what they think and don't do what they say. This was not pejorative; merely an (accurate) observation of what it is to be human. When we buy a bottle of wine, we are purchasing an experience and making a statement about ourselves as much as we are actually acquiring liquid in a bottle. To wine purists (and many educators) who are product-focused, this view is heresy; it's all about what is in the glass. Back in the real world, think about what car you drive and what clothes you wear - these send a subtle, but powerful series of signals about the sort of person you want to project yourself as. Behavioural scientists such as Rory Sutherland call it "the peacock's tail"; it serves no evolutionary purpose other than as a method of showing off, of projection of the self. 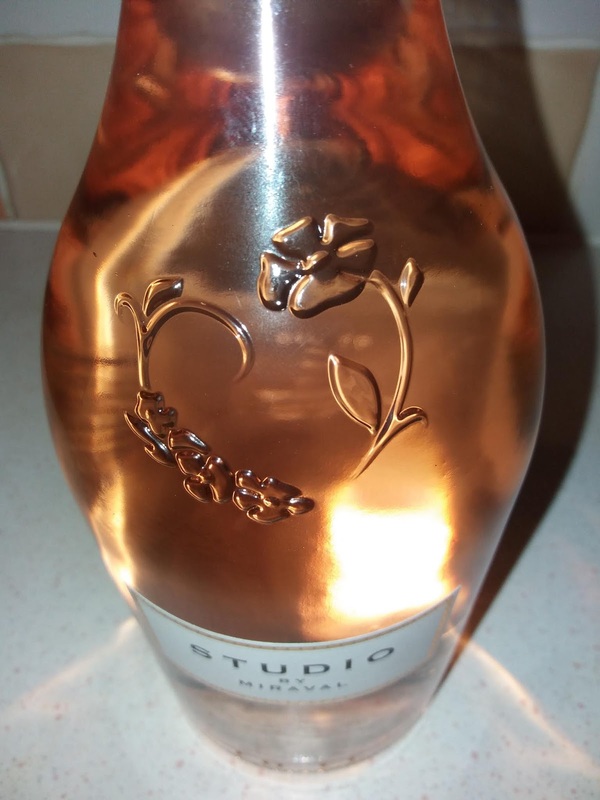 And so it is with this beautiful bottle of Provence rosé from celebrity ex-couple Brangelina; it looks gorgeous and will send just the right signals if you want a sophisticated and reliable rosé to impress guests. Equally, it tastes thoroughly pleasant too, so the liquid backs up the promise of the packaging. It probably costs a pound or too more than an ordinarily-packaged bottle of Provence rosé of equivalent quality, but on the flip side, it also looks more expensive than it costs. So, quality, presentation, value - pick any two. 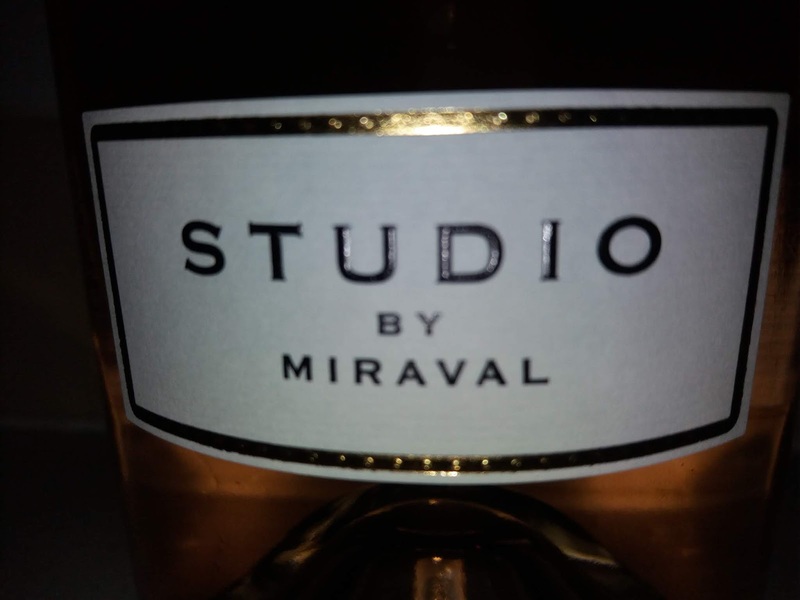 Studio by Miraval (£12, exclusive to The Co-op) very pale, slightly toasty; soft red-berry fruits, garrigue herbs, white pepper and saline minerality; elegant and pure. 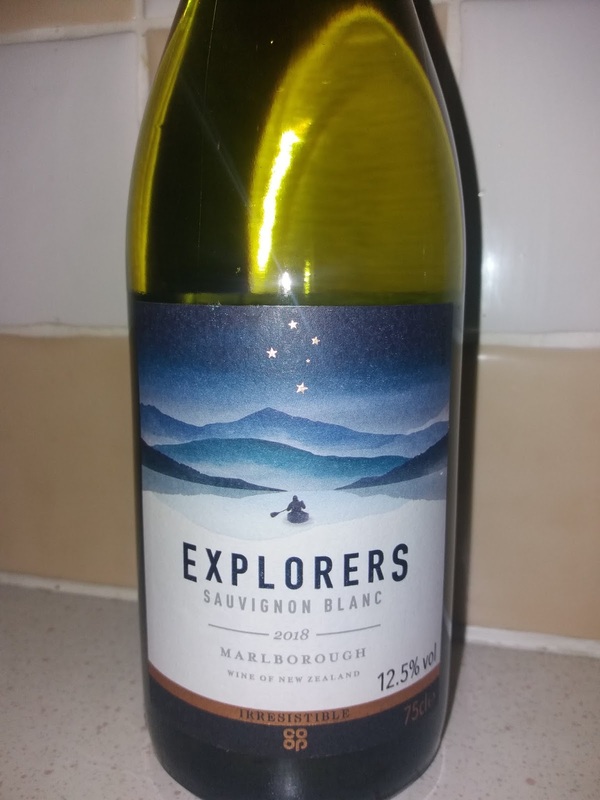 A pleasant sipper, match with picnic food. Training as an accountant several decades ago, I learnt that debits are debits and credits are credits; there's no discussion or debate, them's the rules. The higher-level elements of business strategy call for more imagination, creativity and flair, but historic bookkeeping has to be built on solid foundations in order to bear the weight of assumptions about the future. 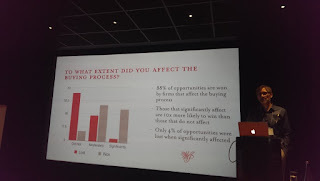 The same applies to advertising, the sector I worked in for many years until recently - there are provable, testable scientific bases to the way people react to advertising and to what works and what does not. I have always, therefore, tended to feel that any discipline that seeks to be taken seriously, such wine-scoring, should equally be based on solid principles; in my world, scoring a wine (should you choose to score it) needs to be based on an objective assessment of its qualities, not merely a subjective opinion. Yes, there may be bottle variation, wine evolution over time, and sometimes just the emotions of the moment (according to Robert Parker), yet I fundamentally believed that wine scoring, when done properly, is objective. First I read Richard Hemming's account of scoring one particular wine at a measly 14.5, one of the lowest possible scores, and another one at 17.5. The trouble was - he points out - it was the same wine. 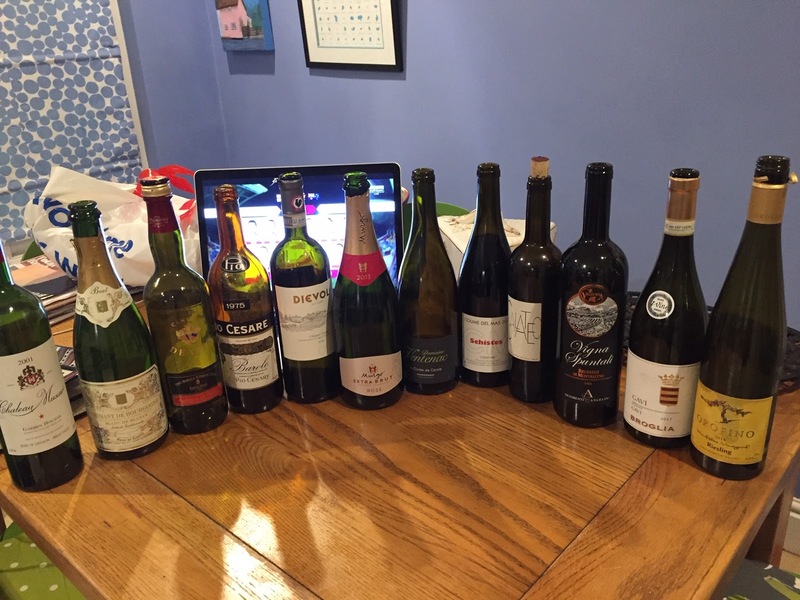 Second, I took along a Chianti and Canadian Riesling to a tasting with friends and found that the Chianti (which I had previously tasted and rated well) became an unassuming wallflower and faded into the background when lined up against better, older or just more interesting wines. Then, even more unexpectedly, the Riesling, which I had marked down as an aperitif / starter wine, showed brilliantly when tasted out-of-order as an end-of-tasting palate refresher. 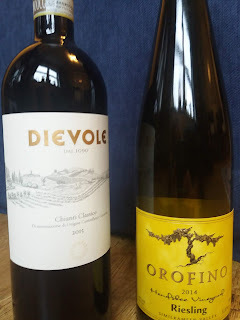 As a side-note, I think the Riesling had the advantage of being big enough to cope with coming after the reds; a fresh, lean, mineral Pays d'Oc Chardonnay (think entry-level aperitif-style Chablis) hit a bum note when introduced in the middle of the tasting. By an appropriate coincidence, the Riesling had been a gift from one of the best business speakers and advisors I know, Blair Enns. 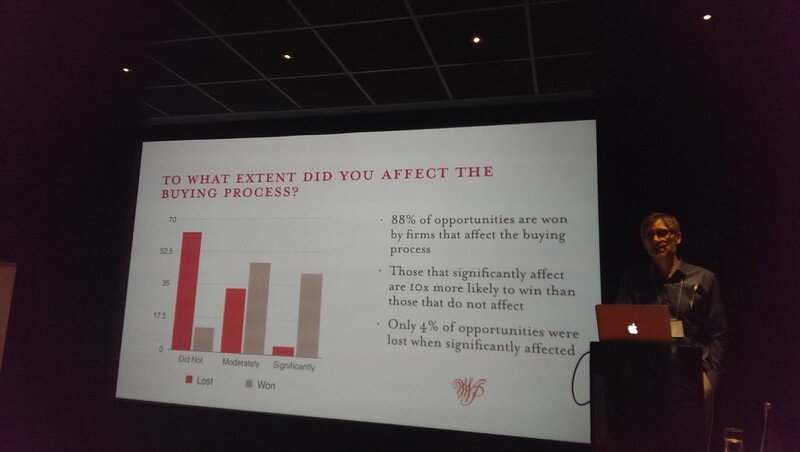 One of Blair's speaking topics is how to Win Without Pitching; in simple terms, the more you do something unique that no-one else quite does, the more business customers will actively seek you out, rather than you having to go out and pitch for it. Conversely, if you just do everything the same as everyone else to about the same level of competence, you will find it hard to stand out in the scrum. So, my Dievole Chianti Classico 2015 (which I had previously rated as Good) did not stand up to a comparison with its peer group, whereas the Orofino Riesling 2014 shone when tasted against some very different wines. Orofino Riesling, 2014, Similkameen Valley, Canada classic Riesling dieselly-limey nose; expressive, rich, vibrant and supple with crystalline lemon-lime and pear flavours; mineral finish. Dievole Chianti Classico 2015 (my original tasting note) very fresh, cherry fruited and floral with spice; structured, mineral and concentrated with fine tannins and a firm, muscular core. Fine and precise. At their best, Languedoc wines combine the arty iconoclasm of punk with the good-breeding of minor royalty. 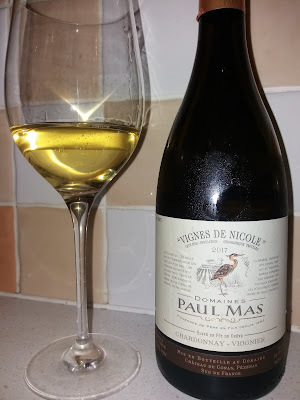 Chardonnay and Viognier are two of the most aristocratic of grapes, adept, assured and complex, here with a balance of southern warmth and elegant restraint. Paul Mas Chardonnay- Viognier 2017 Pays d'Oc ripe orchard and yellow stone fruits, melon and zippy lime with well-integrated oaky spice and leesy minerality. Fresh, supple and harmonious. 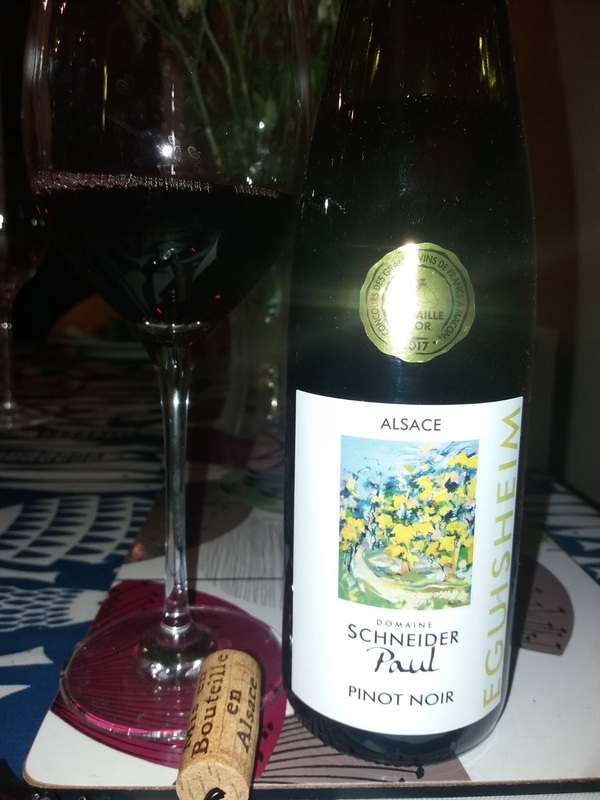 A versatile food wine, match with mixed starters, poultry, meaty white fish or a cheese plate.